The TreeHouse provides plenty of room for playing, visiting with friends, enjoying your food, and celebrating your special day. 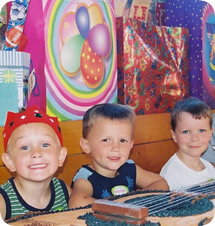 We specialize in accommodating families, large groups and kids of all ages for birthday parties. TreeHouse provides plenty of room for the kids and their families. Your own personal Party Host who helps make the party fun for you, too! Your Party Host will set up your table in advance, serve your party food, refill drinks, keep the table tidy, and pace the party. Choice of food items from our party menu for the children at the party, and the option to purchase sandwiches to feed the grown-ups. Tableware - plates, silverware, napkins, serving utensils. Name tag stickers for each of the children, and a special birthday name tag for the guest of honor. Balloons at your table during your party. You don’t need to bring a thing! Our birthday staff enthusiastically earns tips just like any waitstaff. 15% minimum for all parties. If you choose, we also offer additional items you can add to your party to make it a success. See our pricing table below for optional extras like a snack or meal for adult guests, fruit and veggies, and more! Arrive no more than 5 minutes before your scheduled party time. We will have your table set up and ready for you at your scheduled time. Parties have a fixed itinerary to fit nicely within the 2 hour time slot. Your party host will pace your party and let you know what will happen next (play time, eating time, cake cutting, presents, etc.). After the party, guests who would like to stay longer may pay admission for additional play time. You may bring a cake, but be sure they do not contain any nuts. The TreeHouse is a serious peanut-free facility. No outside birthday cakes allowed without a booked birthday party held with a credit card. You may bring goodie bags for guests, to be passed out at the end of the party, but again... no nuts. You may bring themed plates and napkins if you wish, but we provide all you need. Do not bring themed cups. We use cups with lids and straws. Do not bring decorations such as table cloths or signs. Do not bring ice cream or any other outside food. We cannot store it or serve it. Balloons provided by the TreeHouse are for decoration only, and may not be removed from the table. Please note that we have a strict balloon policy. If you wish to bring additional balloons in your party theme, you may bring in 1 single bunch on its own weight from the balloon store. Balloons must stay on the table until you leave the building, and may not be given out to children while at the TreeHouse. Relax and let your party host take care of serving food, refilling drinks, cleaning up and pacing the party. We want you to enjoy yourself! NEW! Sandwiches for the adults $15 per tray. Enough to feed 12 people a snack, or 6 lunch/dinner. 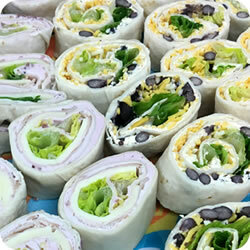 Your choice of rolled sandwiches: turkey or taco (vegetarian), Choose all one flavor, or half and half. (available for parties of 15 or fewer) $2 per child Vanilla ice cream. Kids can add chocolate syrup or sprinkles for no extra charge. Fruit & veggie tray $20 Fresh, seasonal choices of 1/2 fruit and 1/2 veggies, which we prepare for you on the same day of your party. Pitcher of pop or iced tea for adults $5 Your choice of pop flavors or iced tea. During your party, guests may also order from our regular menu and espresso bar. These items may be paid for individually, or the host family can opt to keep a running tab for extras. Every child at the birthday table is included in the per child count for pricing. This includes siblings who are brought back to your party and signed in as guests. If you do not wish to include siblings or others who arrive with your party guests, please provide us a check list when you arrive. Our birthday staff enthusiastically earn tips, just like waitstaff. Minimum 15% gratuity added for party hosts. Your reservation guarantees seating for children who are party guests. We have limited seating available for adults. TreeHouse memberships do not apply toward birthday parties. A credit card is needed to reserve the party time and seating area for your group. A $50 deposit is required when you make your reservation. If you need to cancel your party, you may do so up to 14 days in advance of your party at no charge. If you must cancel fewer than 14 days in advance, your $50 deposit is non-refundable. Planning a party with us is easy! Best times to call are Monday-Friday, 10am til 3pm, or Saturday-Sunday after 2pm. Outside those hours, we have limited office staff available to take party reservations. Our staff will have lots of questions for you, so we can reserve your party date and take care of all the details to suit your group.